Location: Bear Basin Ranch, 473 County Road 271, Westcliffe, CO 81252. Please, NO dogs at the race on Bear Basin Ranch. Go south on Interstate 25 to the Nevada Ave. exit for Hwy 115 in Colorado Springs. Take CO 115 south from Colorado Springs to Florence. Turn left on CO 67 in Florence just after the Carl's Junior towards Wetmore. In Wetmore, turn right on CO 96. About mile marker 11, turn right (north) onto County Road 271. When you see the sign for Bear Basin Ranch on the left, turn left (north) and follow the signs to the parking and staging area for the race. Go southeast to Cotopaxi and turn right just before the General Store on to Fremont County Road 1A. Take CR 1A to CO 69 and turn right (south) toward Westcliffe. Once in Westcliffe, turn left (east) at the flashing light onto Main Street/CO 96. Follow CO 96 through town and out approximately 11 miles East to County Road 271. When you see the sign for Bear Basin Ranch on the left, turn left (north) and follow the signs to the parking and staging area for the race. Enjoy a weekend full of fun activities before and after the Hardscrabble Mountain Trail Run. Bring your family and your friends to the Hardscrabble Mountain Trail Run at Bear Basin Ranch and enjoy a day of fun with Bear Basin guides. Head out on a guided horseback adventure or covered wagon ride and explore 3,500 acres in the Wet Mountains, comprising gently rolling hills, prairie and aspen grove, with unobstructed views of the Sangre de Cristo Mountains! Founded in 1885, Bear Basin Ranch is a working cattle and horse ranch steeped in wonderful history that encompasses seven square miles of high mountain park terrain that is protected with a conservation easement held by Palmer Land Trust. Head to Westcliffe before (or after) the race and enjoy our charming downtown! Enjoy an adventure in the San Isabel National Forest, horseback rides at Bear Basin Ranch, climb our 14,000-foot peaks, hike our trails with breathtaking vistas and dip your hook in our pristine mountain lakes and streams. Enjoy the historic towns of Silver Cliff and Westcliffe and experience our rich silver and gold mining, railroad and ranching history at our museums. After all the fun, enjoy a meal prepared at one of our destination restaurants. Click here to check out all of the wonderful things to do in our area! Westcliffe, Colo., has a variety of lodging options from bed-and-breakfasts, motels, camping in the national forest and RV parks. Westcliffe is 11 miles west on CO 96 from the race location. It's an easy and beautiful drive! Support our youth and land conservation! Sponsor a young person to run or walk the Hardscrabble Mountain Trail Run! "The Hardscrabble embodies everything a mountainous race should be-there is amazing food/music, even better people and it is all placed in a setting that can't be beat. Additionally, the organizers are sincere in their efforts to support land conservation and to promote youth running. 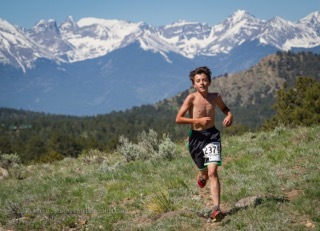 A number of Salida youth benefitted from the youth sponsorship program in 2014 and were able to enjoy the primal feeling of running in the wilderness while being a part of a supportive running community."